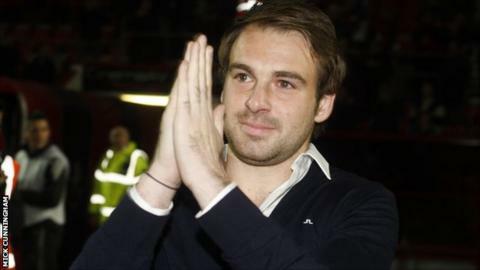 Bournemouth striker Brett Pitman says he is confident the Cherries can handle the pressure of being league leaders. The Cherries went top of League One on Tuesday with a 2-1 victory at Crewe. It was the first time they have led the league this season as their fine run, which has seen them climb from the relegation zone to the top, continues. "We've got characters in the team and a manager and backroom staff that will keep our feet on the ground," Pitman told BBC Radio Solent. Pitman scored both goals as the Cherries defeated Crewe taking his tally for the season against them to five. It helped them continue their fine run of only one league defeat in 21 matches as they moved above Doncaster, Tranmere and Swindon in the table. But Pitman, 25, who has scored nine goals since his return to the Cherries, insists nothing will change about how they approach each game. "We are on a good run, better than a good run, so it's pleasing to get three points and it's nice to win," he said. "It'll be a new experience for us (being top), we've not experienced it before. But we want to stay there for sure. "Knowing Eddie (Howe), he will treat every game the same and with respect, and with the same detail he treats each match whether it's against a team at the top or bottom. "You can come unstuck if you look to far ahead so we'll take each game as it comes." Pitman's first goal came from the spot and it was his third penalty against Crewe this season. He revealed the prospect of taking another penalty against Alex goalkeeper Steve Phillips had been playing on his mind. "I nearly asked the gaffer to get some clips of him facing penalties this season to get some clues as to which way he dives," admitted Pitman. "But I thought that might confuse me even more. I changed my mind last minute, luckily it went in."